Friends of the Earth International and the Heinrich Böll Foundation (which runs this website) have joined forces to produce an international version of the Coal Atlas originally published in German earlier this year. Craig Morris reports. The Coal Atlas offers insights into the role, risks and future of coal in energy systems around the world. Did you know that peat is a kind of precursor form of coal with as little as a fifth as much energy content as the highest grade called anthracite? Or that the lignite burned in Germany is of very poor quality and roughly half water? These and other tidbits are now available in the new Coal Atlas. For instance, since 1990 the number of reported cases of miner’s lung has dropped only slightly from around 29,000 to around 25,000 worldwide, with slightly more women (around 15 percent) affected today than in 1990. Part of the problem with mining is radioactivity; the overburden contains radioactive materials that enter the environment during excavation. The Coal Atlas provides an impressive overview of global coal issues. 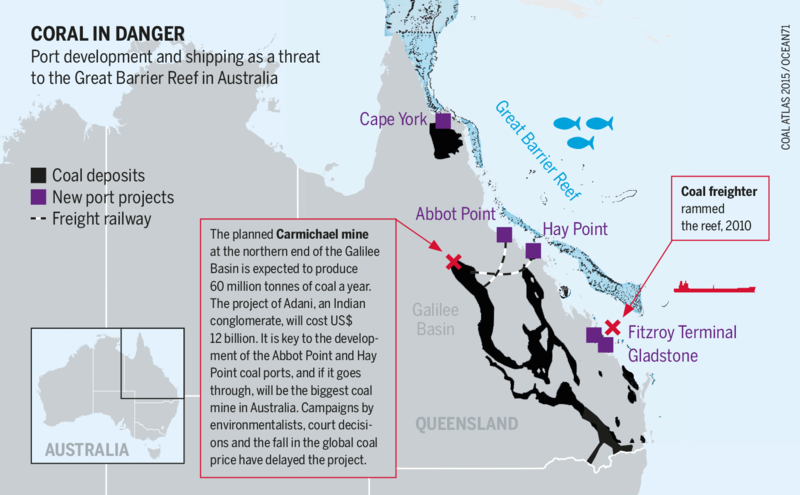 Here, the coal deposits that Australia plans to excavate for export. But you don’t have to be a miner to die from coal power – on the contrary, China alone estimates that some 250,000 people in the country die each year from coal-based pollution. The figure in the EU is estimated at 18,200 annually. The external costs of this pollution is estimated at between 9 and 27 USD cents per kilowatt-hour in the Appalachians, where electricity goes for around 10 cents. The EU’s emissions trading platform has unfortunately failed to make coal more expensive, and the Atlas points out other policy options, such as the minimum price for carbon in the UK and France’s tax on fuels. The Atlas’ strong point is its global coverage. One section is devoted to coal projects forcing people to relocate – from Bangladesh to Mozambique. The Coal Atlas also reproduces an overview of protests against the coal sector put together by the Environmental Justice Atlas. Campaigns seem to be especially numerous in India, but Germany has also had a strong anti-coal movement for decades – especially in the past 10 years. Of the 38 coal plants originally proposed in Germany a decade ago, 22 were blocked and several others delayed. 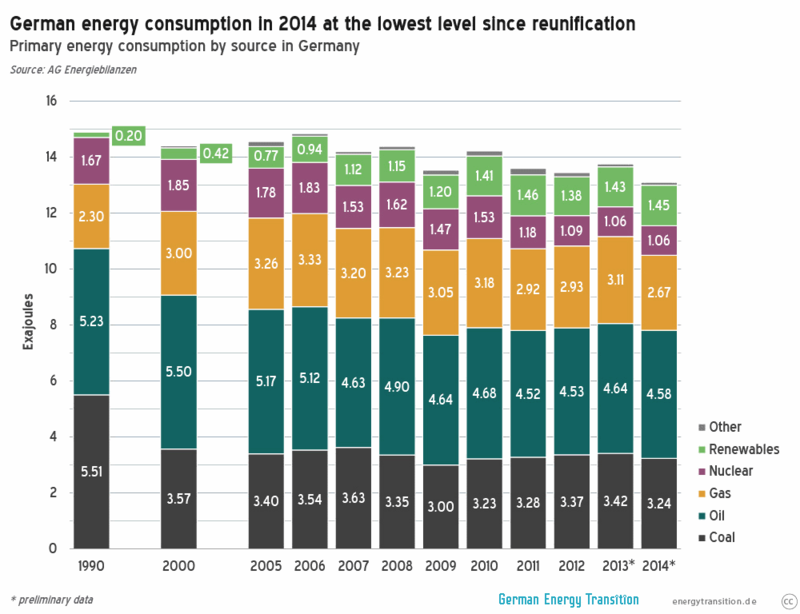 For Germany, the Atlas sticks to the old meme: “Germany is phasing out nuclear power and has come to rely more on coal for its electricity.” Never mind that coal consumption fell in 2014 to the lowest level since 2010 and will fall this year once again; like opponents of the Energiewende, anti-coal campaigners within Germany are happy to stick with 2013 numbers as long as they can. Some findings deserve a better explanation. For instance, one chart has the health costs related to coal power higher in France than in Germany although France has almost no coal plants, while Germany gets around 45 percent of its electricity from coal. Perhaps the figures are correct, but they warrant an explanation. The paper also says “460 tons of overburden are excavated each year” in Rhineland (one of only three major lignite areas), “including 388 tons of uranium.” I assume “460 million tons” is meant; otherwise, Germany would practically be scooping out pure uranium (it produces none). The Atlas was published too soon for some interesting trends. It hints at lower prices for coal on international markets without mentioning the term that Goldman Sachs coined (in late September, too late for the Atlas) for the reason: “peak coal.” But unlike peak oil, peak coal is about demand, not supply; countries around the world are stepping away from coal power, with India being the only major exception. Crucially, coal consumption continues to drop in China. It seems that the downturn for coal power may be coming faster than the Atlas itself dared to hope.